Having a crush on someone is both exciting and terrifying at the same time. If you’ve got it bad for someone, first let yourself feel all the feelings. Then, if you don’t want them to know you have a crush, try to act normal around them. Otherwise, turn your flirt on and make the first move. Fingers crossed they’re crushing on you, too! But if they aren’t, pick yourself up and remember that there are plenty of other crushes in your future. 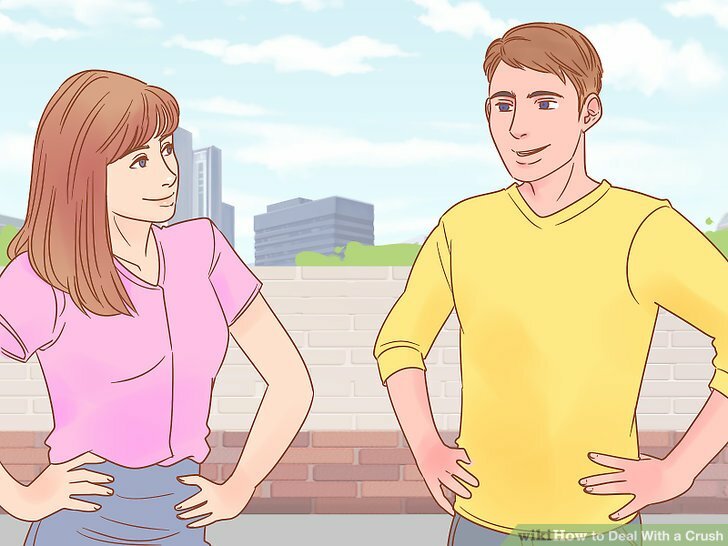 Copy their body language if you want to show that you’re interested. Mirroring is a popular body language technique where you imitate how the other person stands, moves, and talks. It “reflects” that you’re in sync with them. For example, if they’re leaning in, lean in, too. And if they take a sip of their drink, well, you take a sip of yours. It’s so subtle, they won’t even realize what you’re doing. This works in conversation, too, with tone, pitch, and words. For example, if they’re using a sarcastic tone, mimic that. And if they’re speaking softly, lower your volume as well. Mirroring should be natural and understated. Don’t copy every single thing they do. Just try to imitate their overall body language. Otherwise, if you move every time they move or obsess over it, they’ll notice something is off. 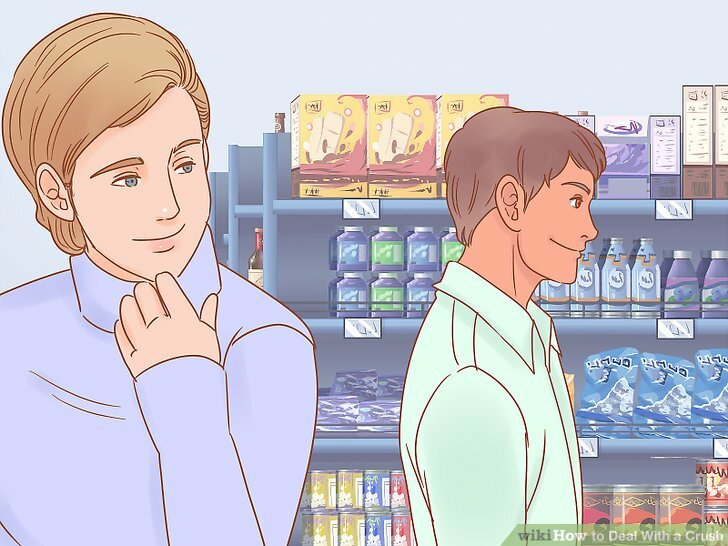 Act normal around them if you want to keep your crush a secret. No matter how much you might be freaking out on the inside, keep your actions calm and collected on the outside. That means talking at a normal pace and volume, remembering to breathe, and carrying a normal conversation. Just be yourself! For example, if you’re typically pretty reserved or quiet, don’t suddenly start chatting nervously nonstop. 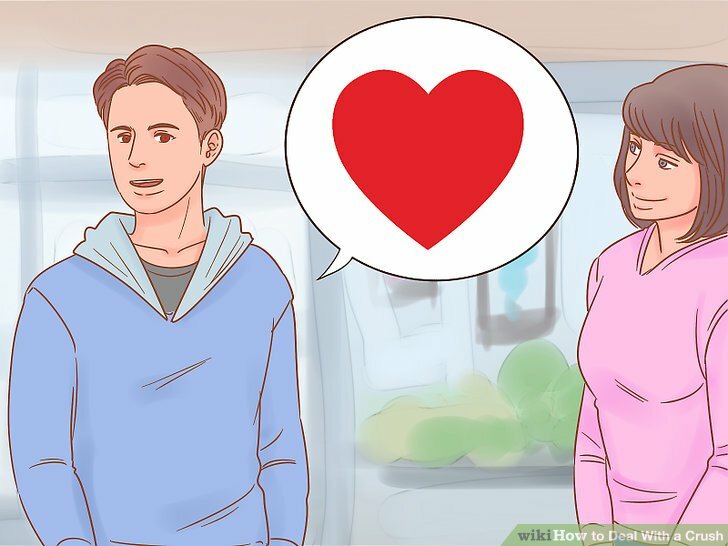 On the other hand, if you usually talk to your crush a lot, try not to get tongue-tied or silent around them. Avoid trying so hard to hide your feelings that you end up being mean or hurting your crush. For example, joking and teasing is okay if it’s harmless, but don’t say something like “Wow you look like you’ve gained a few!” if you know they’re self-conscious about their weight. If you’re struggling to act normal or if you get really nervous around them, try taking a few deep breaths to calm your nerves before you start talking. Focus on the sensation of the air flowing in and out of your nostrils. Give yourself some distance if you aren’t able to hide your feelings. If you think you’ll make it obvious that you have a crush, like by acting embarrassed or tripping over your words, it’s best to spend less time around that person. Otherwise, they’ll be able to detect your romantic feelings, which could make things awkward for you. For instance, don’t go to the party they’re hosting or change your normal hallway route so you don’t run into them outside homeroom. If you’re in the same class or have another unavoidable activity together, you can still give yourself space. For example, sit at a different table or ask someone else to be your lab partner. Don’t make it obvious that you’re distancing yourself. For instance, if you see them walking towards you in the hall, don’t dramatically run away. Instead, smile back politely and keep walking. Distract yourself by spending time doing things you love. The more time you spend sitting alone at home, the more time you’ll obsess over your crush. 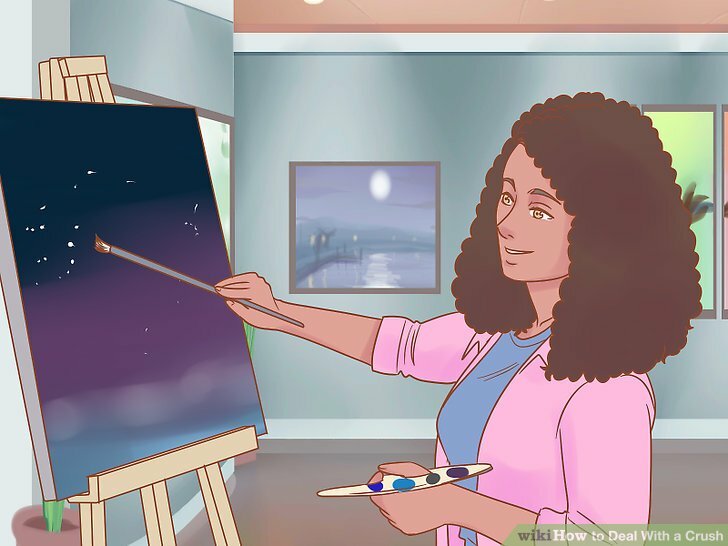 Instead, find fun ways to fill your time and take your mind off your feelings. For example, make plans with different friends so your weekend is completely booked, or teach yourself a new hobby. Not only will focusing on yourself make you stop thinking about them, it will also make you a more cultivated person in general. Win-win! If you still find yourself checking your phone while you’re with your friends or doing another activity, try putting your phone on “Do Not Disturb” mode so you won’t get notified if they text you, or unfollow or mute them on social media. Journal about what you’re feeling if you aren’t ready to talk about it. Maybe you don’t want to tell anyone about your crush, but you also don’t want to keep everything bottled up inside. Instead, write down your emotions in a journal. For example, note what you like about your crush, how they make you feel, what you wish would happen, etc. Remember that your journal is for your eyes only, so don’t hold back! Let your thoughts flow freely and write whatever comes to mind. You can also type out your thoughts in a Microsoft Word document on your laptop or in the Notes app on your phone if you’d like. Journal as often as you want to or need to. You can set aside time every day to do it, or simply write when the inspiration strikes. For instance, you might just journal after you have a run-in with your crush. Tell your friend about your secret crush if you feel comfortable. If you just have to talk to someone how you’re feeling, but you don’t want to tell your crush, open up to a friend who you trust. Remind them that they cannot tell anyone else, and that whatever you say has to stay between the 2 of you. Then, let the gushing begin! Pick a private place, like in your bedroom or in the car, to have these conversations. You don’t want anyone to overhear who isn’t supposed to. 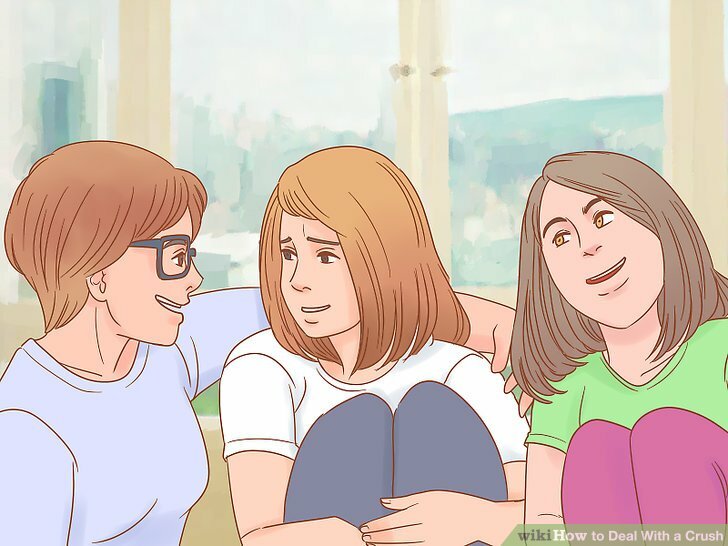 Don’t tell your friends about your crush if you don’t trust them or if they have a reputation for being unable to keep things to themselves. Choose wisely who you tell. If you’re worried about your friends accidentally spilling your secret, talk about your crush to your parents or older siblings instead. They can give you advice on how they’ve dealt with their own crushes, too. 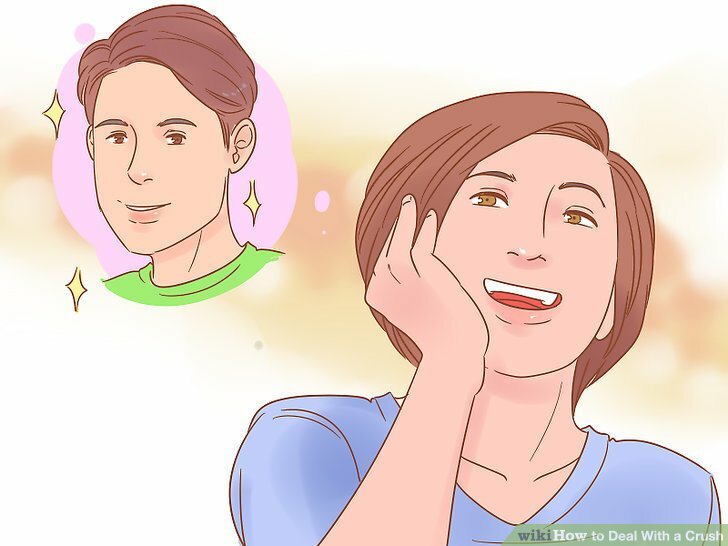 Enjoy the fun of having a crush by letting yourself fantasize sometimes. Crushing on someone isn’t all bad. In fact, it can be super exciting! Allow yourself to feel those ****erflies in your stomach and dream about the perfect date with your special someone. You can also embrace your new romantic side by listening to love songs, watching romantic movies, or reading sappy poetry, for example. 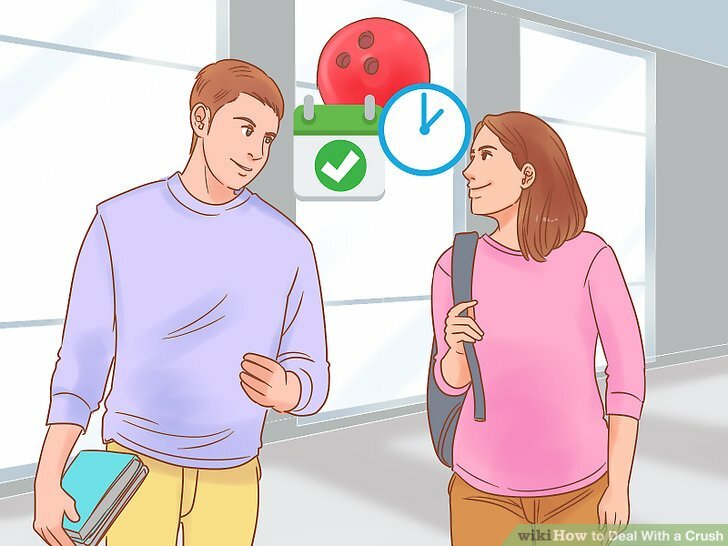 To prevent your crush fantasies from consuming your time and life, schedule time to think about your crush, as silly as it sounds. For example, set a timer for 20 minutes every night before bed. After those 20 minutes are up, turn your attention to something else. Come up with a list of their flaws to put things in perspective. When you have a crush, you tend to start thinking of them as this perfect person, which makes your obsession even worse and it makes it hurt even more if they reject you. 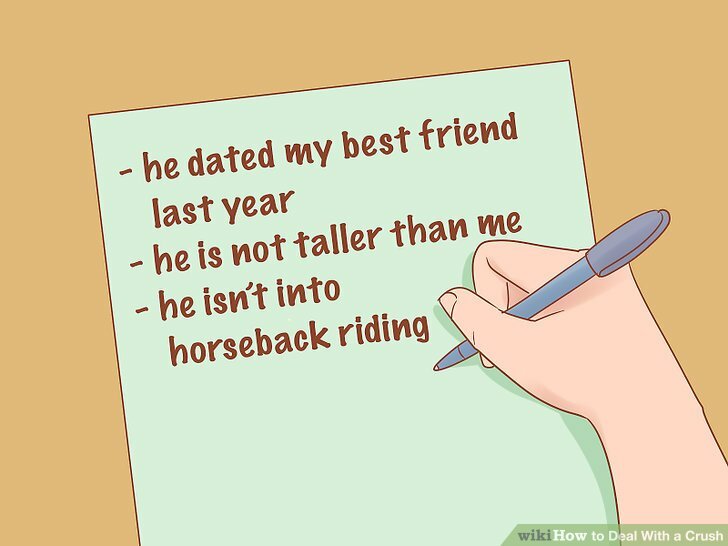 Brainstorm what isn’t so great about them, like whether they aren’t into horseback riding like you are or whether they dated your best friend last year. 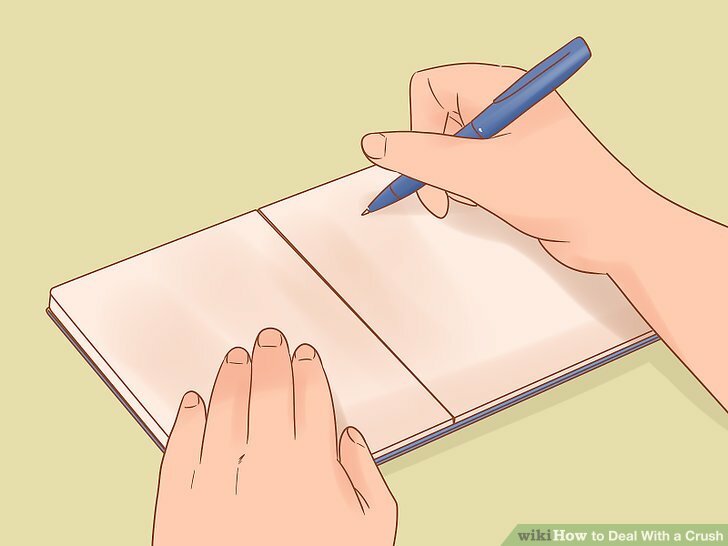 Write the list on a piece of paper or keep it on your phone, then look at it whenever you feel that you’re getting carried away. The “flaws” can be whatever makes them less than your ideal person, no matter how picky or insignificant those characteristics seem. For example, maybe your crush is exactly your height, but you prefer someone taller than you. Ask plenty of open-ended questions to let them talk about themselves. Being able to keep the conversation going is important when you’re flirting. And people love to talk about themselves. Let your crush do most of the talking by asking questions about what they did last weekend, who their favorite band is, or how they like to spend their free time. Focus on questions that require more than a “yes” or “no” so the conversation continues flowing. Ask a question like, "If you could be an animal, what would you be?" instead of "Would you want to be a cat?" Or ask, "What do you think about the book we're reading in English?" instead of "Do you like the book?" Don’t force questions into the conversation. Too many questions will feel more like an interview than flirting. Ask them whenever it feels natural and choose questions that follow the topic of conversation. If they say they love pizza, for example, ask something related like, "What are your favorite toppings?" instead of jumping to a random question like "What's your favorite song?" Drop subtle hints in conversation if you’re too shy to ask them out. You’re definitely not the one who’s going to make the first move, and that’s okay. Get them to do the asking by strategically including signs in your next conversation. 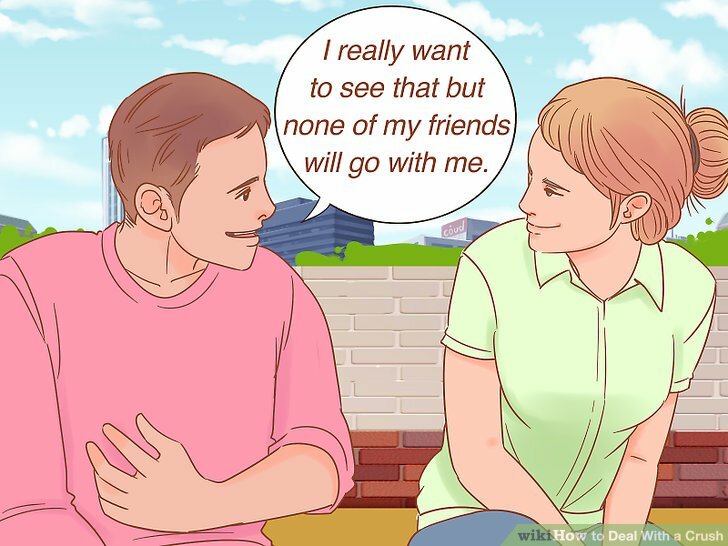 If the 2 of you are talking about favorite movies and they mention one they’re looking forward to seeing in theaters, say, “I can’t wait to see that one, either!” or even, “I really want to see that but none of my friends will go with me.” That leaves the perfect opening for them to ask if you want to go with them. Don’t be discouraged if they don’t pick up on your hints. That’s the thing about being subtle: It doesn’t always work. It works both ways, too. 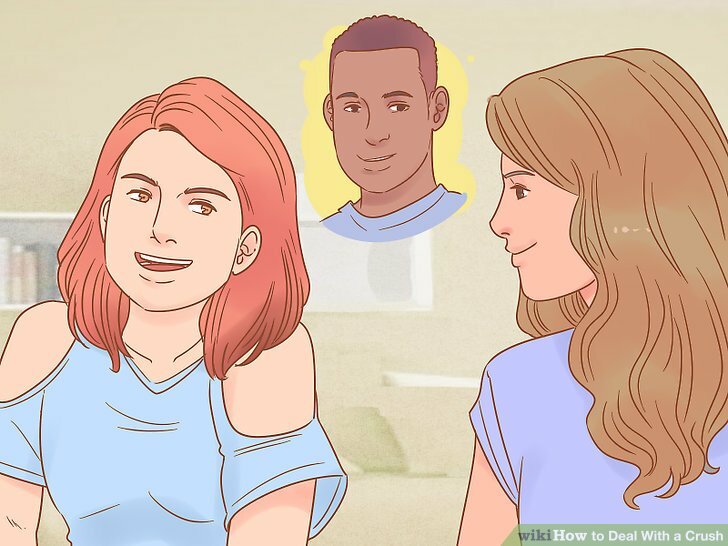 If you notice that they’re dropping hints about hanging out, realize it might be a sign they want you to ask them out. If they aren’t free at the time that you suggested, offer another time. But if it seems like they’re blowing you off, take the hint. For instance, if you ask to go bowling on Friday and they say they're busy, say "How about the following weekend?" If they're still busy say something like, "Okay, well just let me know the next time you're free!" Keep it casual by inviting them to a group outing or party. If you aren’t ready for a one-on-one date or if you’re not totally sure they’re into you, ask them to hang out with you and your friends or go to the football game on Friday night with a bunch of people from English class. It takes some of the pressure off and gives them a chance to see you in your natural element, surrounded by your friends. 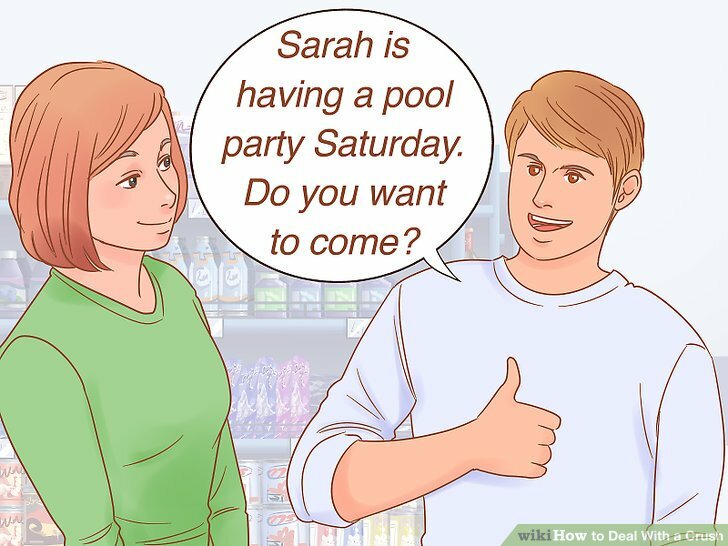 For example, if your friend is throwing a party, ask, "Hey, Sarah is having a pool party Saturday. Do you want to come?" The one downside of group outings is that you might not get much face time with your crush. Make it a point to pull them aside for a few minutes during the event, whether it’s to go get drinks for everyone or to chat a little bit away from the group. Keep in mind that inviting someone to a party or hangout with a bunch of other people is very subtle. They may not get the hint that you’re interested in them so increase your flirting during the event to make it clear. Ask them out with a grand gesture if you’re feeling brave. With great risk comes great reward, even in the world of dating and crushes. If you’re 99% sure they’re into you or if you simply are ready to fully go for it, brainstorm an outside-of-the-box way to ask them on a date. Some examples include sending them flowers, writing “Will you go out with me?” in chalk on their driveway, or serenading them with a romantic song. It will definitely make you stand out and prove how much you like them. Get inspiration by looking up promposals online or searching the #promposal hashtag on Instagram. These tend to be very over-the-top. Adapt them to fit your style and preference. Be prepared that they might say no. 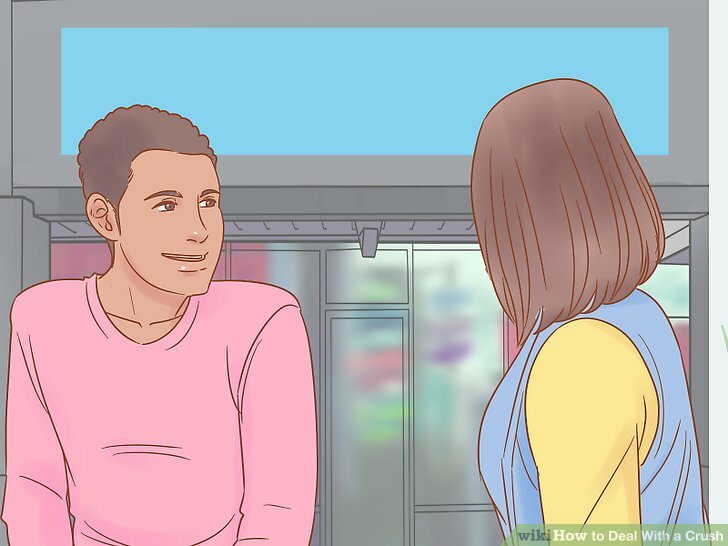 If you’re asking them out publicly, that could be humiliating for you. Remind yourself of what’s important by using the 5-year rule. Ask yourself, “Will this matter in 5 years?” The answer should be no, if you’re asking yourself whether a little crush will make that much of a difference in your life overall. While it might hurt now, remember that in the scheme of things, it’s a very small blip. Even if you’re convinced you just lost the love of your life, you have to accept that it’s not meant to be. Ask instead, “What will matter in 5 years?” and focus on those things instead, like your education or career. If you think the answer is that yes, your rejected crush will matter in 5 years, ask yourself why you feel that way. Is it because you think there’s no one else out there for you? Challenge those thoughts by digging deeper and listing the reasons why your thinking is irrational. 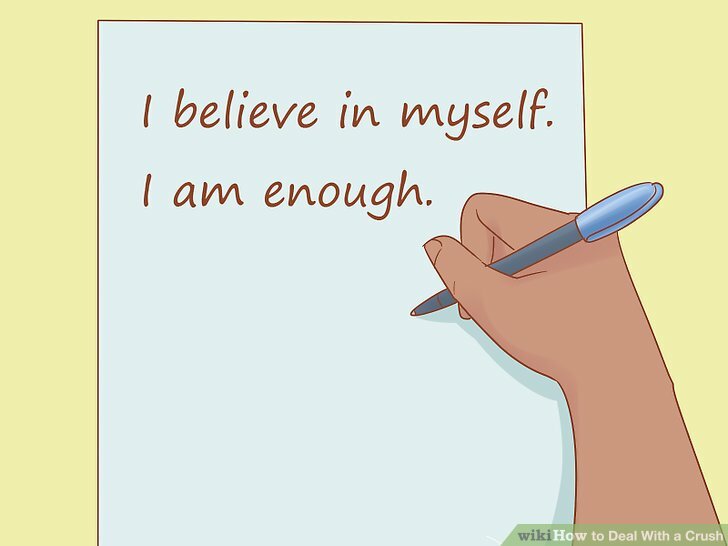 Write down positive affirmations and put them where you can see them. It’s tough not to feel like your crush wasn’t into you because you weren’t good enough. Remind yourself of how awesome you really are by writing down uplifting sayings like “I believe in myself” or “I am enough” on sticky notes. Hang them in places you’ll see every day like on your bathroom mirror or your closet door. Change the background of your phone to be a positive quote image, too. Whenever you check the time or get a text message, you’ll see it. Find positive affirmations with a quick Google search or browse inspirational boards on Pinterest. Make your own Pinterest board filled with quotes that you can refer to when you’re feeling down. Surround yourself with the people who love you for you. It’s healthy to take time for yourself and cry, but don’t withdraw. Rely on the support of your friends and family to get you through your hurt. Spending time with people who value and appreciate you will not only make you feel better about yourself, it will distract you from the sting of your rejection. Say yes when your friends ask you to join them for a night out, even if it’s the last thing you want to do, or call your mom just to talk when you’re feeling lonely. 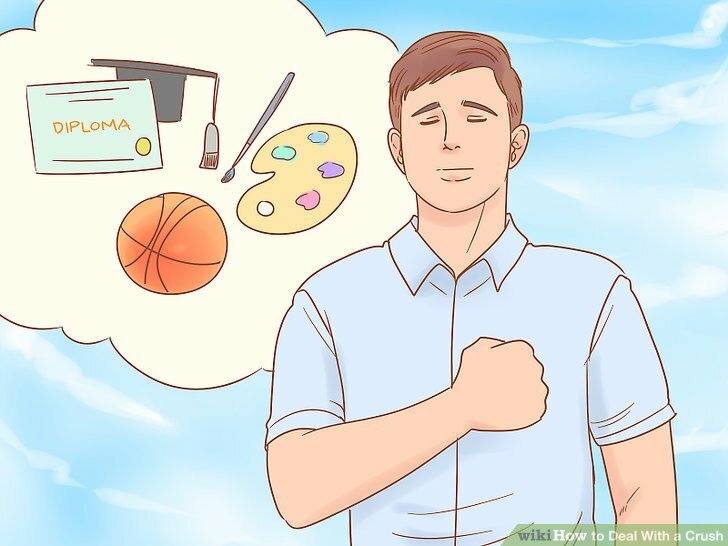 If you’re really struggling, ask your friends and family to write down some of their favorite things about you in a list and look at it whenever you need a confidence boost. Be careful you don’t use socializing and activities to completely avoid your pain. Find a balance of social time and alone time. Get professional help if you can’t move on after 4 to 6 weeks. While it’s totally normal to be sad or hurt after you get rejected by someone, it is not normal if you feel depressed or if your emotions are preventing you from everyday life. 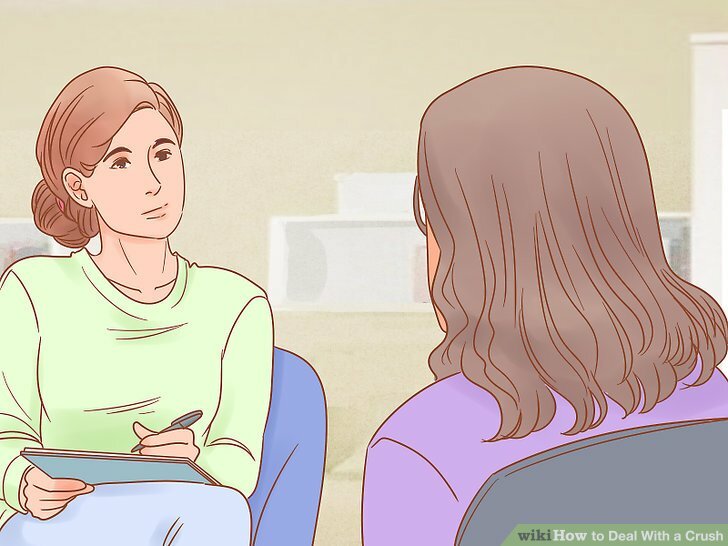 Make an appointment with a therapist or psychiatrist to work on healthy coping techniques and ways to challenge negative thoughts so you can move on. A psychiatrist is able to prescribe medicine if you have a chemical imbalance like depression that can be treated medically. Find a therapist who’s covered by your health plan by contacting your insurance provider. They’ll give you a list of doctors who you can see and only be required to pay a small copay. If you’re feeling suicidal, get help immediately. Call the emergency room or the National Suicide Prevention Lifeline at 1-800-273-8255. Guess who has a crush on Chetan?